Fragments of dreams are sometimes magical and awe inspiring, and such a dream happened to me last night. In the fragment I remember, I was running with a herd of thousands of does. I was human, and yet I wasn’t. I was a doe and yet I wasn’t. I was the tracker, the hunter, the seeker, and yet I was also a part of them. We ran through forests and through hillsides and through deep dark woods and the lighter deciduous forests of my childhood. We passed by a treeline near a country house similar to my grandmother’s, but the house was quite unimportant, possibly the only human element in the dream. The herd stopped at a treeline that was both in the forest and not, like it was a deeper forest in the lighter forest. From this treeline came a procession of stags, one by one. These stags were not like anything before seen, and were as much vegetation as they were beast. Their horns were huge, thick, and almost made of wood, and the racks dripped with flowers and vines. Their fur was brown laced with green, and they moved with the grace of deer and the power of trees in the wind. Beyond this the dream gets fuzzy, and I remember little. Yet, these stags were haunting enough, as was the run with the does, that one, if not both, will hopefully become sketches and possibly art pieces if I ever get the time. 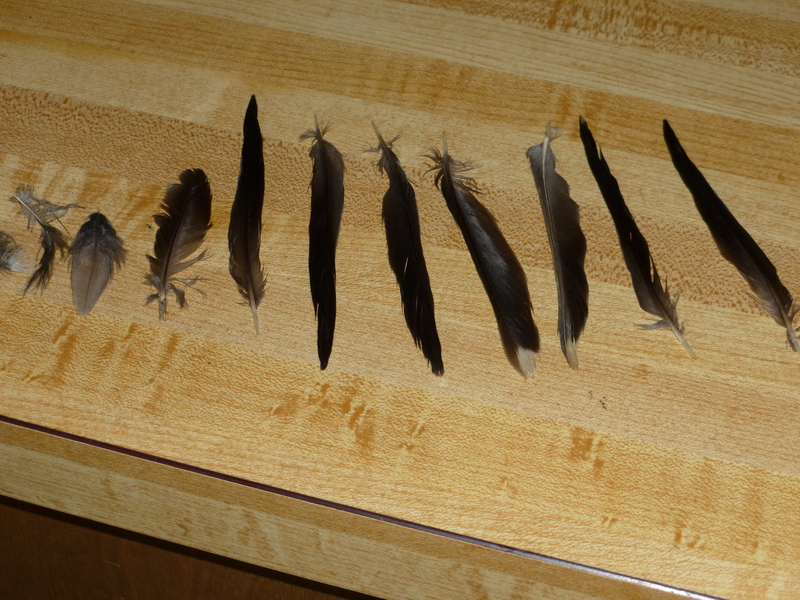 On my daily walk today, I also came across a series of feathers. First, I saw just one, and then I saw several, not just the ones I collected but many pieces of down as well. I’m fairly sure a bird was hit here, but there was no sign of the corpse. I have no idea what kind of bird it was either. 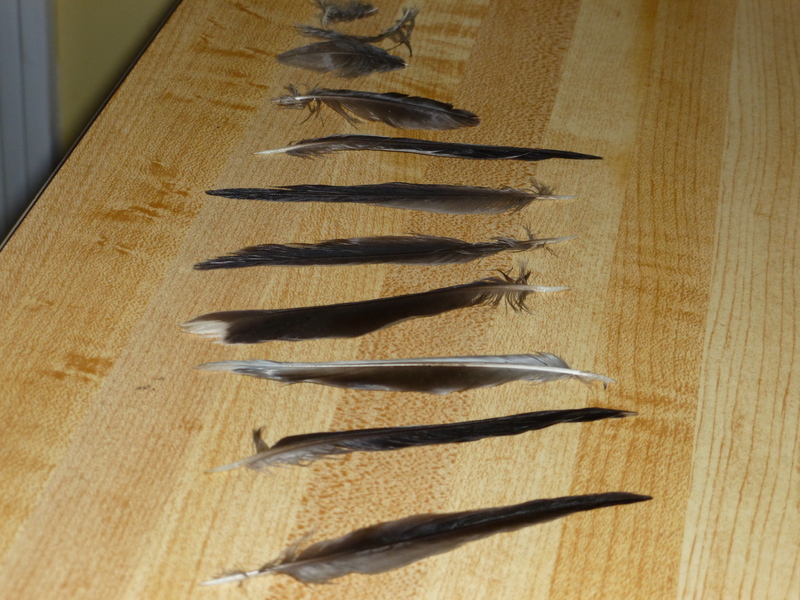 I first laid the feathers out on the counter to get a good picture, and now have them on my altar/shrine. I am about to light a patchouli stick and a tea light to honor the bird’s spirit and ask for it’s blessing for me keeping the feathers. This is a new step for me, as I’ve got many animal parts but have never really done any sort of ‘releasing’ ceremony yet for anything. It’s intimidating and feels a bit silly but I hope to eventually feel the power in it. Little actions make for a big journey. Early Sunday afternoon, my new lovely man and I went hiking in the local park. I talked him into walking the creek bed with me, and while I rolled up my pants legs and started to go barefoot, the chilly water quickly made me put my canvas sneakers back on just let my shoes get juicy wet. He avoided most of the water with his long legs…Some days being short is more fun than being tall! 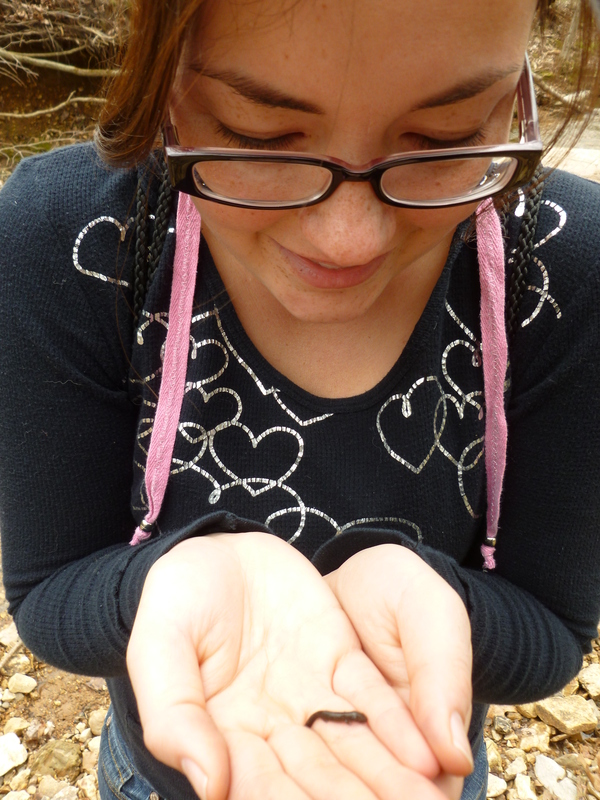 While looking at rocks and picking up the occasional trash, we came across a few delightful little critters! 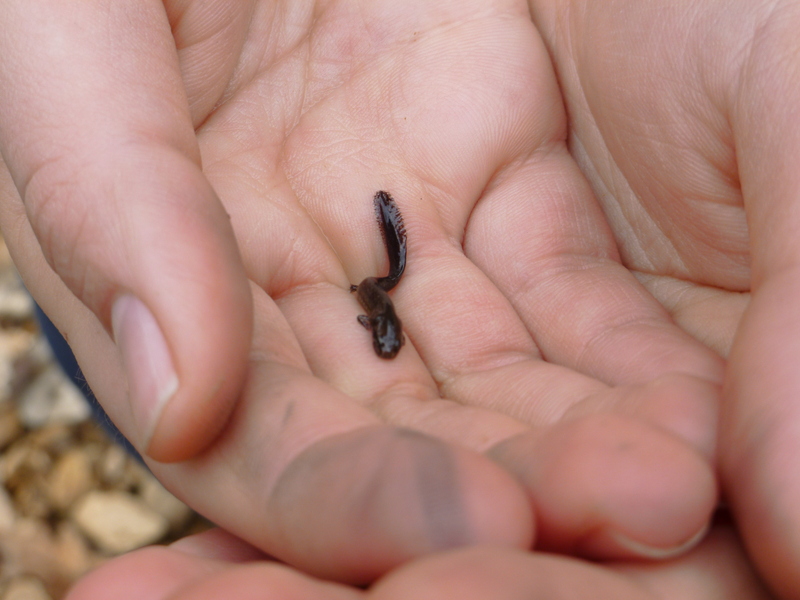 As I never really played with frogs as a kid (I didn’t have a creek growing up, just a field that I caught grasshoppers and lightning bugs in) I can’t tell if this is a big tadpole or a tiny salamander, but it was soooo cute and slimy! A few quick photos were snapped and then back into the stream he went, into the calm little area we found him. Yesterday was Hekate’s deipnon. For an offering I left some fish (and green beans and rice) that I had prepared at dinner, along with my garlic plant (the poor dear was dying, I felt compelled to at least offer it to Hekate instead of letting it rot in the pot as I can’t use any windowsills in this house anymore for plants) at the edge of the driveway in a small area of bushes and plants and stones. 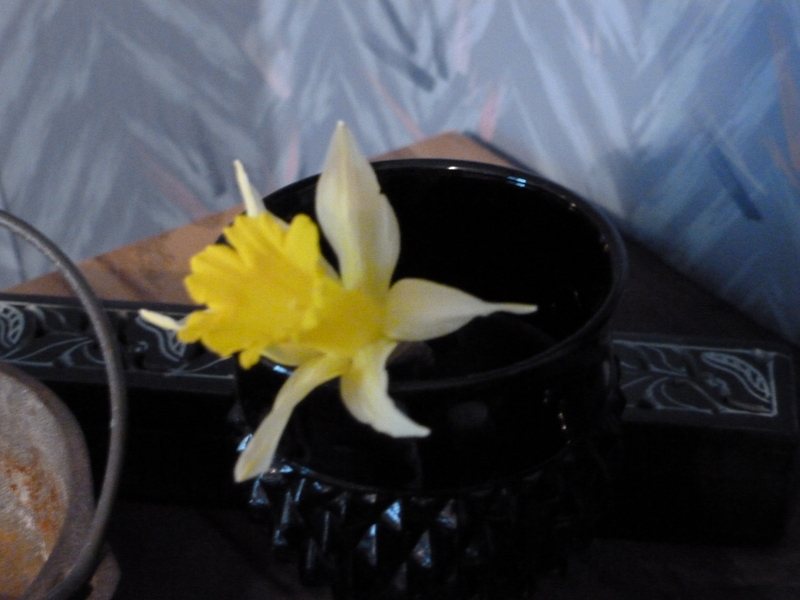 Today, for the Noumenia, I placed a small daffodil on Hekate’s altar in my chalice with some water. I left an apple at the offering area at the driveway and then also tossed 3 apples to the deer behind my mother’s home. Whether or not this is proper at all for the Noumenia, I have no idea, but it’s a start!